A little white boy was watching his mother in the kitchen making a chocolate cake from scratch. 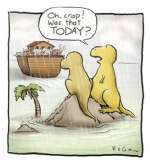 Illustration of two (2) Dinosaurs missing the life saving Noah Ark. How to tell you've been really bad. A very funny and humorous video of people getting the crap scared out of them.